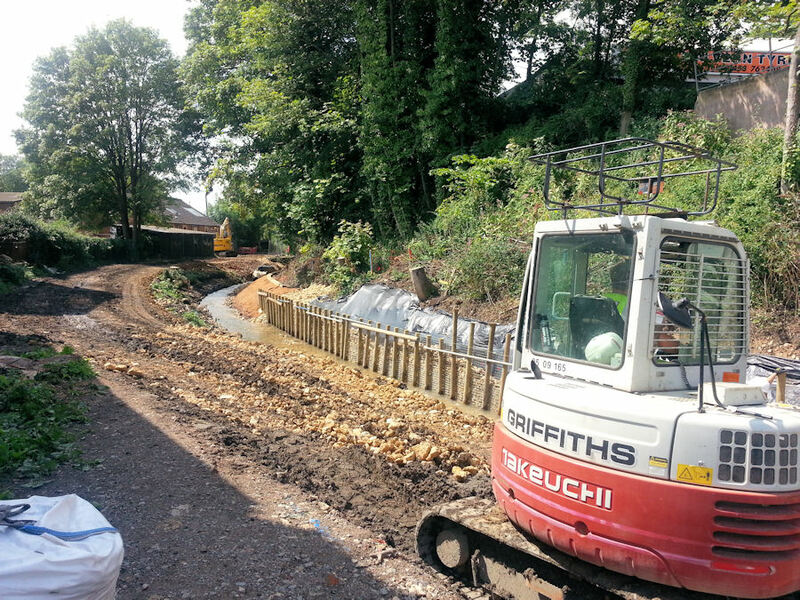 The first stages of work at Lower Wallbridge Lock by Alun Griffiths Contractors of Abergavenny are progressing well. Over 200 fish have been relocated from the water above the lock to the canal at Lodgemore. Fences have been installed all around the site… and with very good reason it seems! Project Manager Kevin Sunderland (pictured right) explained that the site has its challenges. “It is a long narrow place to get our plant and materials in and out. Having dealt with the greenery Kevin’s team has gone on to survey the alignment of the works and seek out some electricity cables. The concrete dam immediately above the lock has been removed to lower the water level for the next stages. Those stages involve widening and deepening the navigation channel above the lock to 5 metres wide x 1.2 metres deep. The photos and web cam pictures show a light brown matting material being pegged to the side of the embankment above. This material is coir matting. Coir is a natural fibre extracted from the husk of coconut. Technically, coir is the fibrous material found between the hard, internal shell and the outer coat of a coconut. The matting provides organic erosion control for slope and embankment stabilisation. A post and mesh revetment is currently being installed along the north side of the channel. This revetment is back filled with stone over a polypropylene membrane. The next steps at Wallbridge Lower Lock involve the design of the reinforcement for the lock bypass channel. This will carry the flow from Slad Brook around the outside of the lock. The by-pass channel will also enable fish and eels to migrate upstream. Although the canal restoration project is mainly funded by the Heritage Lottery Fund and Stroud District Council, the work at Wallbridge has been assisted by a generous £100,000 grant from the Veolia Environmental Trust. Ian Edwards, the council's Canal Manager, said "Technically, this is a very difficult site in which to work. Access is very difficult and would have been impossible without the kind assistance of landowners. When this work is complete, yet another length of derelict canal will have been returned to its former glory for everyone to enjoy." Click here and here, or on the icons below to find out more about Coir matting and Giant Hogweed… and why it is a good idea to stay outside the fencing!